Irish Distillers Pernod Ricard, the world’s leading Irish Whiskey producer, has unveiled a new look and line-up for its popular Powers range, reflecting the company’s vision for Powers as a contemporary, super-premium whiskey, recognised for its flavor, quality and craft. Changes to the range include the addition of a new Single Pot Still expression, Powers Signature Release, which will be available in Ireland and the USA from September 2013, plus new packaging and a new recipe for its seminal Powers Gold Label. Powers Signature Release was introduced to whiskey fans for the first time in the US at WhiskyFest Chicago in April this year and will be on shelf in the USA and Ireland from September. 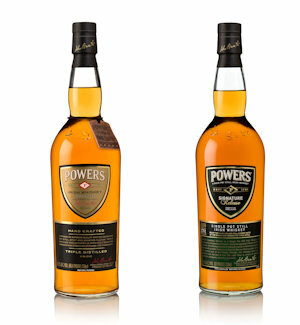 The new-recipe, new-look Powers Gold Label has taken inspiration from the brand’s history and features a higher strength abv of 43.2% and will be non chill filtered, allowing the spicy pot still character of the whiskey to come to the fore. Being able to release a non chill filtered whiskey at strength lower than the industry norm of 46% is directly related to the proprietary triple distillation process which Powers uses. The updated packaging reflects the super-premium nature of the whiskey and brings Powers Gold Label in line with the look of the other whiskeys within the Powers family. The new whiskey and packaging format will be available in the USA from September 2013. The introduction of the new-look Powers range is the latest in a series of innovations from Irish Distillers, owner of the world’s leading Irish whiskey brand, Jameson. May 2011 saw the release of its award winning range of Single Pot Still whiskeys and a subsequent release of numerous other whiskeys reaffirming the company’s commitment to growing the Irish whiskey category and to improving consumer awareness and understanding of the excellent quality of Irish Whiskeys at all price points.